Yes, educators do respond to email marketing, and a new report looks into just how much, and what devices they use to access email and complete other tasks. The study of nearly 400 million marketing emails sent to identify prospective customers found that K-12 teachers responded to promotional email campaigns in the first half of 2017 at higher rates than they had in the previous two years, while K-12 leaders’ responsiveness decreased in the same timeframe. In the first six months of 2017, just over 6.8 percent of K-12 teachers opened marketing emails, according to MDR, a Dun & Bradstreet company that is an integrated marketing services agency. That compared to about 5.5 percent in all of 2016 and over 5.8 percent the year before. The “click-through rate”—a measure of how many recipients in an email marketing campaign are engaged or interested enough to click on links within it—for K-12 teachers was trending up. It stood at .97 percent for K-12 teachers in the first half of 2017, up from .93 percent in all of 2015. A study last year found that, of all forms of internet advertising, emails were the most influential in teachers’ decision to make a purchase. But K-12 leaders are tougher customers when it comes to email marketing. Their open rate for emails declined from nearly 7.4 percent in 2015 to just under 6.5 percent in the first half of 2017, and the click-through rate also fell, from .62 percent in 2015 to .46 percent in the first six months of 2017. And educators are using different devices to access those emails, as the graphic below shows. “One in five people are looking at the same email on two or more devices,” said David Clemen, MDR’s director of digital marketing and a co-author of the report, titled Digital Market Trends in the Education Market. That’s why e-mail marketers should “take into account all the possible devices” an email could be displayed on. Problems for marketers arise when emails are not carefully targeted to the intended audience, Clemen said. For instance, a company that tries to sell a 3rd-grade math product by sending a promotional email to a list of that includes K-6 teachers will get lower open and click-through rates because of the scattershot approach. 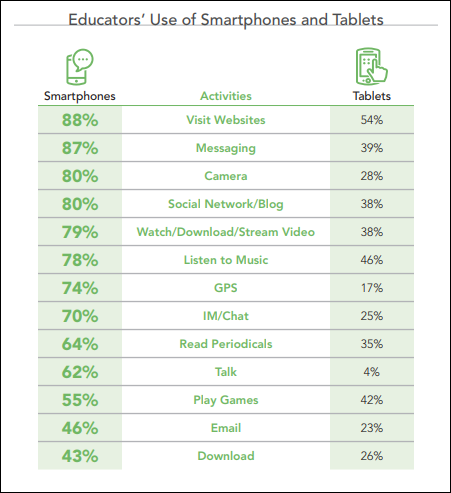 The study also looked at the ways in which educators use smartphones and tablets, with various activities identified in the following chart. The generational shift to younger educators is changing how emails should be designed for marketing. “Millennials and Generation Z…generally do not have any issue clicking through an email and downloading a pdf, or making a purchase on a mobile device,” the report’s authors wrote. Clemen said he decided to produce the report, and offer it for free, based on his background working for major banking and insurance industries, where email marketing was always considered “a workhorse” that got consistent results. “In the education space, there was this narrative…that email wasn’t as effective as it once was,” he said. “The reality is…the days of just ‘spray and pray’ are over,” in terms of using a scattershot approach to an email marketing campaign for specific prospective customers in education. “You have to be a lot smarter” about who will receive emails, what to say in them, and when to send them, he said. I’m a teacher of English working in a High school. I want to know your digital teaching method.